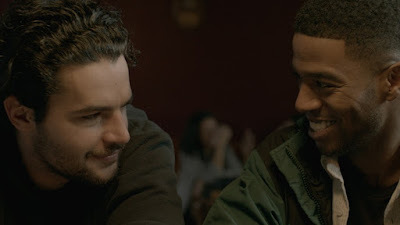 Bookended as it is by a young man’s parental deaths over the course of a few short months, James White is an emotionally fraught viewing experience, yet not for the paint-by-numbers, hammy melodrama you would expect. Rather, writer-director Josh Mond, producer of the excellent Martha Marcy May Marlene, brings a similarly minimal approach here to create an unflinching character study that relies on performance over traditional narrative. The result is an immersive mood piece, which is impressive—more so in that it’s a feature debut—and also brave in its stark depiction of the ravages of terminal illness and the emotional turmoil that accompanies it. It is a confrontational opener, much like the eponymous James White. An unyielding camera introduces us to him via extreme close-up, immediately creating a claustrophobic tension that makes it clear this is a conflicted character. This forced perspective on him will remain largely throughout the film, which, considering that James is not a protagonist easy to sympathise with, makes for some uncomfortable viewing, the viewer as disorientated as the character himself as he aggressively flails his way through life. The technique was a risky move, given that the tight framing has us straining for a bigger picture, but it brings us closer into James’ mind—he too needs to broaden his world view but is currently incapable—and highlights his disconnection from those around him. As such, the camera effectively operates as a narrative device, capturing every nuance to cross James’ face. The change in his psychology is reflected by wider shots later in the film, as he gradually becomes more grounded and faces responsibility. It’s remarkably astute storytelling, and the edit reflects the far-from-smooth trajectory his growth as a character follows. Of course it’s a method that could not have worked without a believable central performance, and Christopher Abbott is outstanding; the part requires a diverse emotional range that runs the gamut from directionless rage and arrogance through to a palpable love and fierce loyalty for his mother, and the fact he’s able to illustrate this complex journey largely via facial expression alone is quite something. Complementing him is Cynthia Nixon as Gail, his cancer-stricken mother. She too is superb, also portraying conflicting emotions, this time fear and defiance as she accepts that there won’t be another remission. Together, the two actors convey an intimate, tender rapport to heartbreaking effect, particularly given that tensions between them are not skirted over. The further beauty of the film is in its ambiguity—a sharp contrast to the very real emotions. A family member jibes that he’d expected James to wind up in jail, implying that he's always been given to violence, but this is not elaborated on. Vagueness of this ilk can be frustrating, but to paint a clearer backstory would be to forget that the story is a snapshot of James’ life at this time alone. This ambiguity takes us to a conclusion that does not guarantee he is going to get his life on track. Appropriate, as James doesn’t know either. James White is released on DVD in the UK today.